No mythology here, unless you count Family Lore and pet ownership. I just need to record some Cat-Love for posterity. So if you don't care about my history of cat-ownership, I won't be offended if you want to skip these next couple of posts! Before I was born, according to family lore, my oldest brother's best friend moved away. My brother took it kind of hard, so my parents decided he should have a pet, to help. He got a kitten, I'm not sure where from. 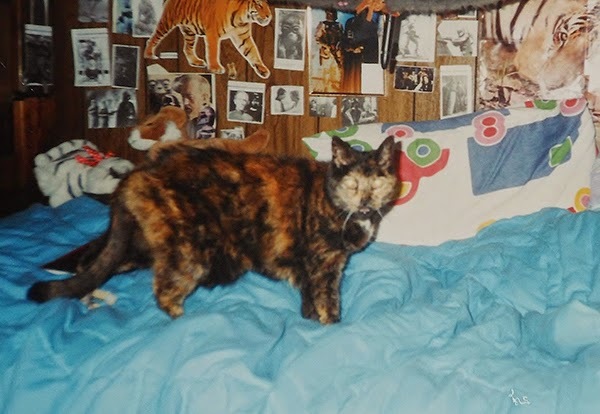 She was a calico, and he named her Patches. Four Years Later, I was born. Some of my earliest memories are running down stairs first thing Saturday morning and throwing open the cellar door to let Patches up from the basement, where she had spent the night, and then rushing to beat her to the living room and tuck myself in under a blanket on the couch so I could call to her and she'd jump in my lap. 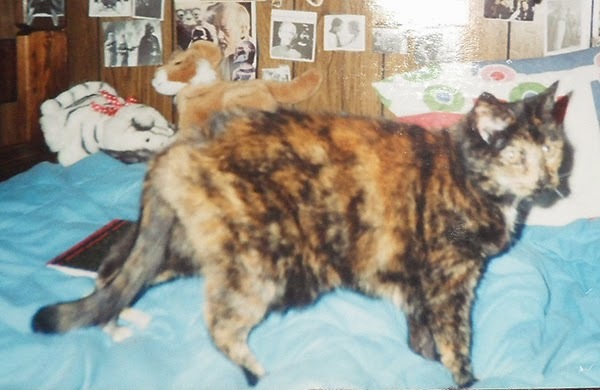 Patches belonged to my brother, technically, and he fed her and cleaned her litter box, and took care of her, but at some undefined point in my childhood and her adolescence, it became fairly well acknowledged that Patches was my cat. And I was her person. The older we both got, the more steadfast our relationship grew. She would wait for me on the corner of our block when I walked home from school, and follow me back to the house. She would stealthily stow away to sleep on my bed, then hide under it until my parents had given up on retrieving her, wait for the house to go quiet, and sneak back out to curl up near my feet at night. She sat on my homework, sometimes even ate it, like every most excellent pet will, and was pretty much just awesome. but they appear to be MIA right now unfortunately. When I was a junior in high school, Patches died. She was at least 19, if not 20, and had lived a very, very long life. Losing her broke my heart, all the same, of course. She was my best friend, my first friend, the most loyal cat of all cats, and during the last year and a half or so, I had kind of taken her for granted. Those regrets still weigh heavy, even all these years later. Thor's Day is the Happening Place.